The NQ Business Admin & IT class, The Business Bees, need your help with with their charity work Mary's Meals and The Salvation Army. Every little helps so please drop off food and clothing donations in to the box next to front of Reception area before the 31st of January. Get On Your Bike, Get Fit And Care! 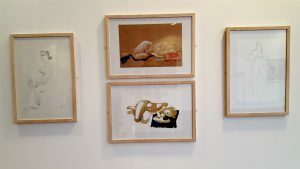 We have a busy Blog update for you this week with plenty of pictures for you to view. The college and students have been involved in several activities over the past week, including taking part in recognising young carers on #CareDay18, encouraging exercise and of course not forgeting the opening of Velocity, our fantastic new cycling hub. So we will make a start. 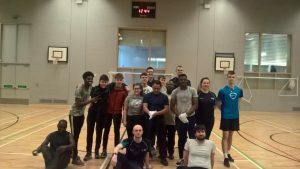 ESOL students took part in Team at GKC on Monday the 19th of February. 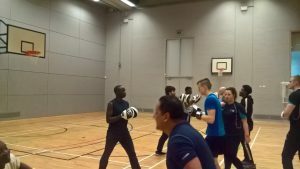 They received excellent coaching from NQ Fitness level 6 students. 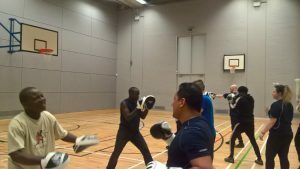 They tried basketball, boxing and fitness, learning how to hook, jab, squat and lunge. 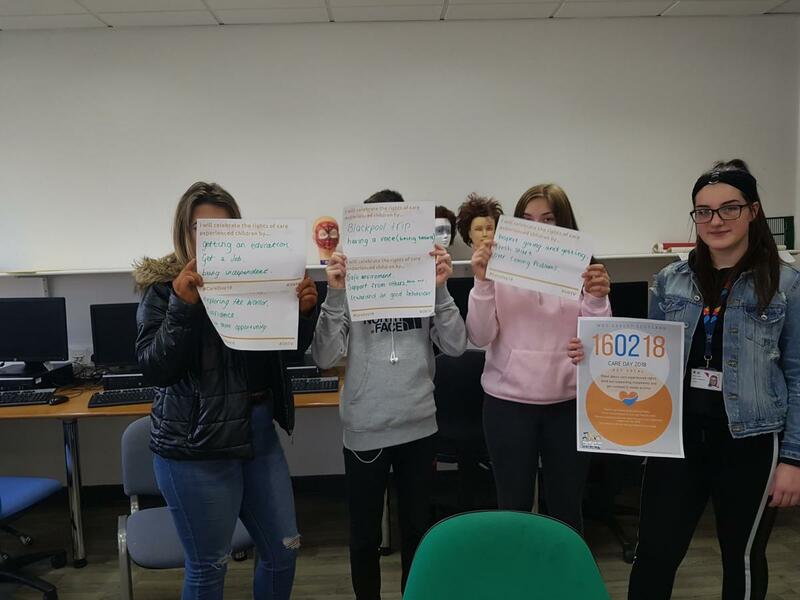 It was a great way for them to meet students from across the college, to get involved in wider college life and to practise their English speaking and listening skills. 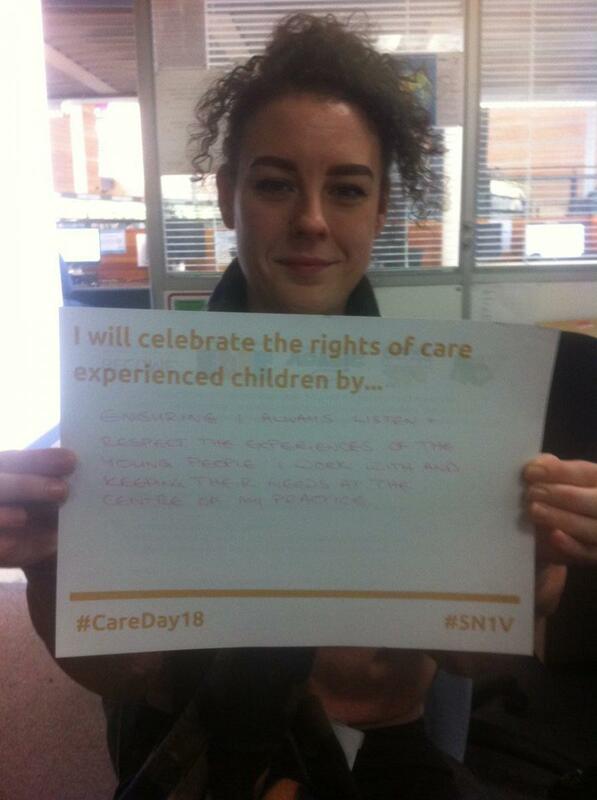 Staff and students celebrated #CareDay18 (Friday 16th February) by writing messages of support to care experienced children and young people across the UK. 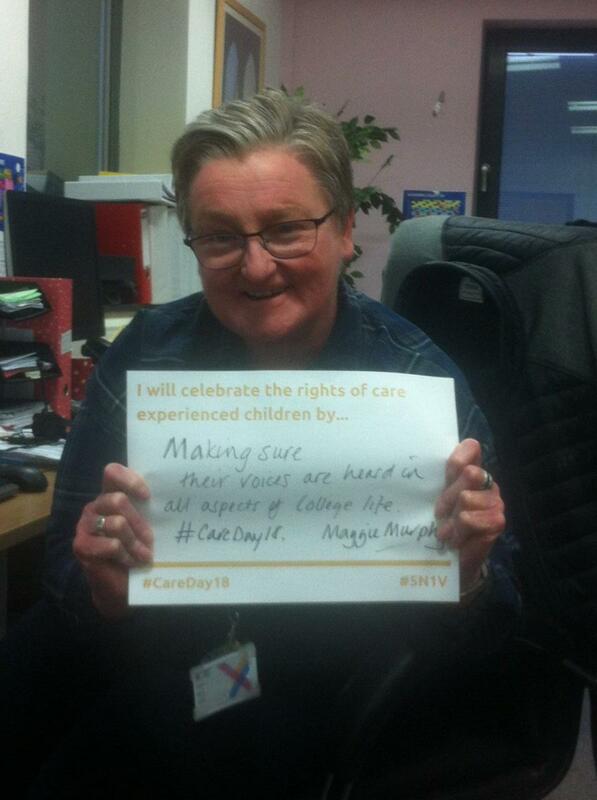 Care Day is the world’s biggest celebration of children and young people with care experience. Care experience includes children and young people who are or were cared for by parents or other family members with the support of social workers; by foster carers; or children and young people from children’s homes and residential units. 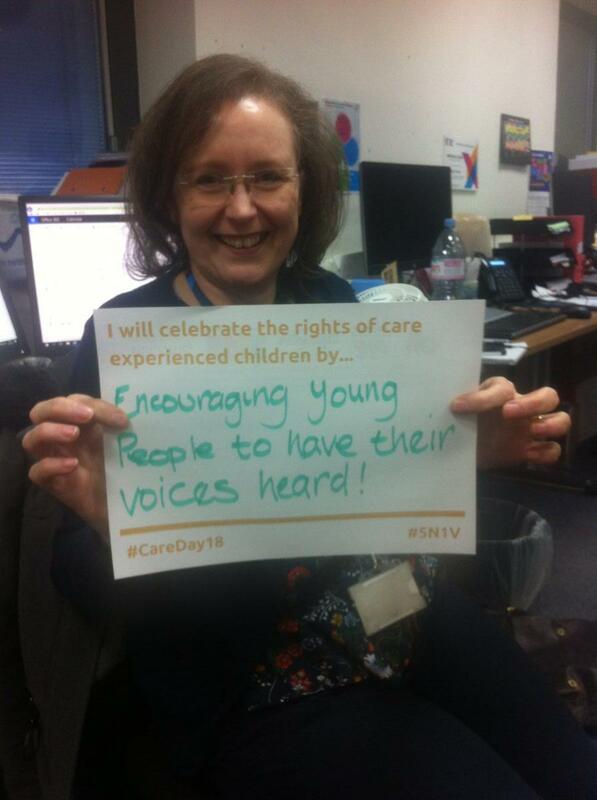 They deserve to be celebrated, on care day, and every day. be given the same opportunities as everyone else!!! build resilience to deal with everyday situations!! be treated like an individual! HND 2 Art students have started an upcycle furniture business called ‘Back to the Furniture’ in partnership with Reconnect and with support from Bridge to Business. 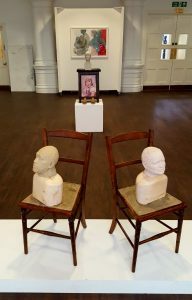 We are looking for unwanted items of furniture to work on to place in the new exhibition space at West and create a more appealing café/bar type of environment. If anyone would like to donate please contact Alastair Strachan, astrachan@glasgowkelvin.ac.uk . 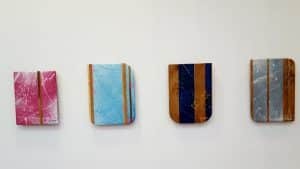 The first exhibition at the new Gallery North space at West is ‘We Said, We Did…’, a show of work by art staff; Alastair Strachan, Dominic Snyder, Jane Telfer, Nicola Carberry and Stevie Walker. 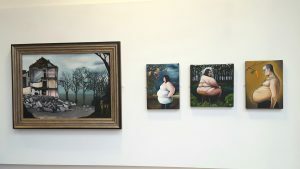 Please pop in for a look if you are at West. College Says Get On Your Bike! 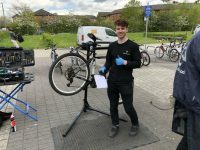 Glasgow Kelvin Colleges Springburn campus in the north of the city has opened an innovative new resource to encourage students, staff and visitors to cycle to college. 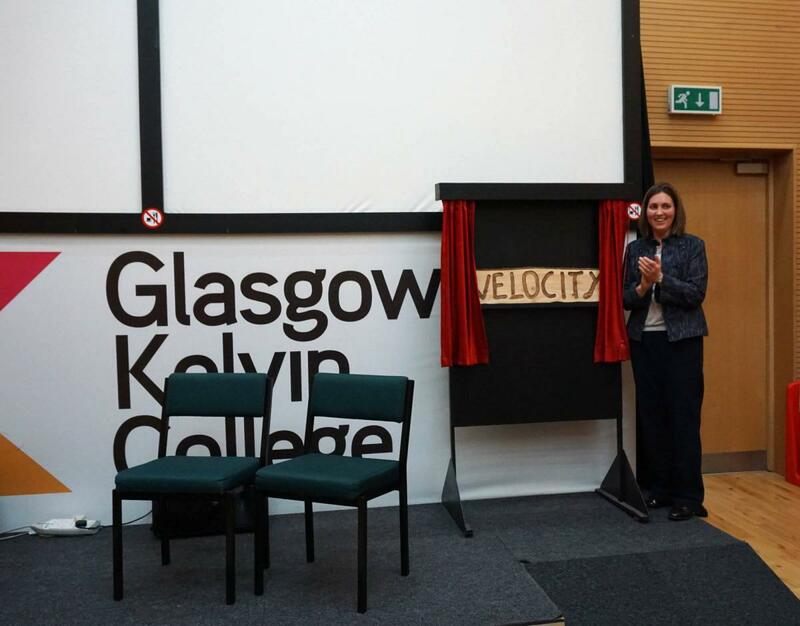 The GK Velocity Cycle Hub was officially opened by Councillor Anna Richardson, Sustainability and Carbon Reduction Convenor at Glasgow City Council who unveiled a plaque and, with Keith Irving, CEO of Cycling Scotland and Alan Sherry, College Principal, dispersed ‘wildflower bombs’ to mark the occasion. 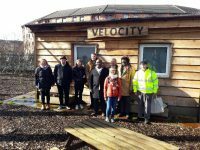 The brainchild of a group of Glasgow Kelvin’s Support to Learn students and staff in 2016 to encourage outdoor and cycling activities, the GK Velocity project gathered support and momentum. This culminated in funding from Cycling Scotland to appoint a Campus Cycling Officer and support from the City Council Community Planning Partnership to build a Cycle Hub. The building has been constructed using sustainable materials, including larchwood cladding and a sedum roof, and will provide a resource centre for cyclists – a one-stop shop for training, information, repair & maintenance and motivation for an active and healthy lifestyle. 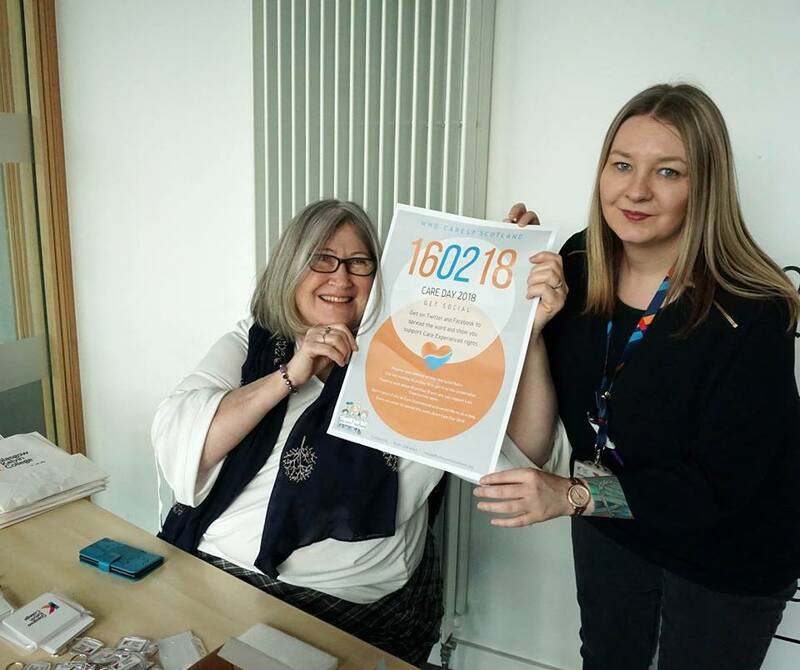 After the success of last year’s pilot scheme in Springburn campus, we’re running the challenge at Eastend Campus Library to promote reading for all. 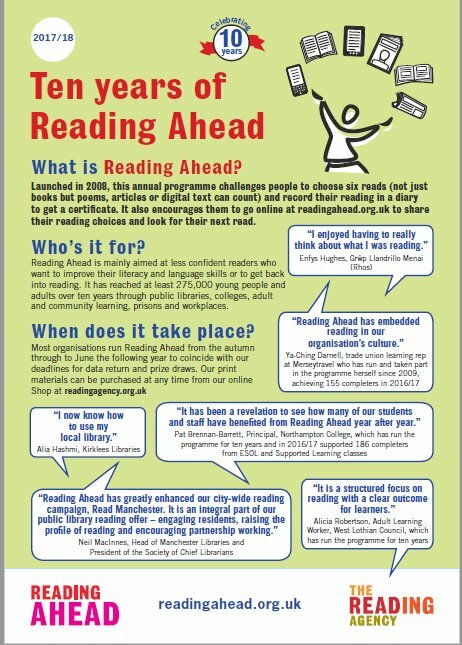 The Reading Challenge (formerly the six book reading challenge) encourages users to read and review 6 books. Library staff will be on hand to help you. Come along and register for this exciting challenge. You will receive a diary to record what books you have read and a section to write your own book review. 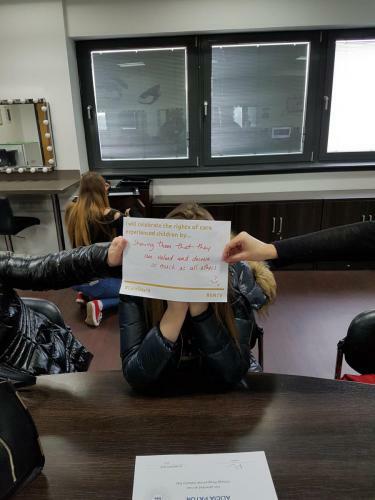 Incentives will be given out after every diary entry; and a final awards ceremony for those who have completed the challenge will be held at the end of the academic year. 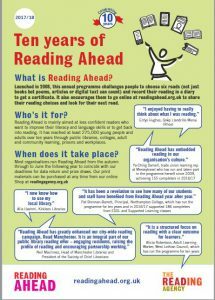 If we don’t have the books you’re looking to read, then tell us and we will try to get these for you through our partnership with Glasgow Life. 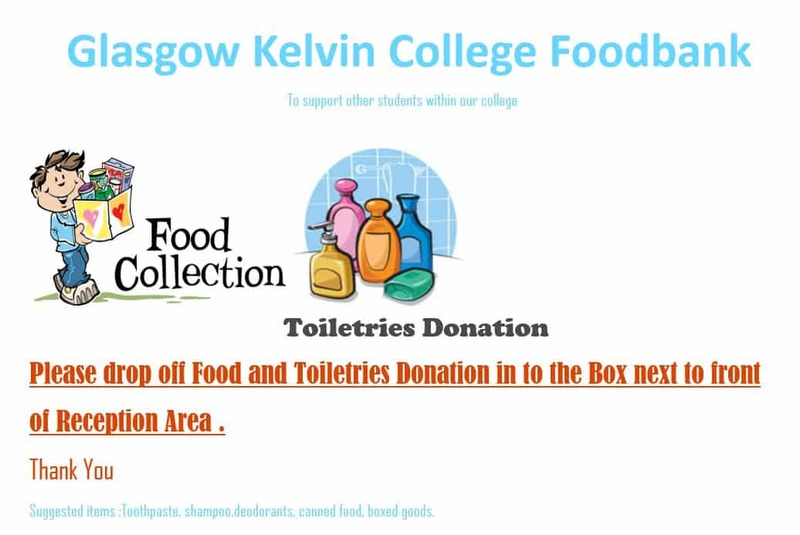 Glasgow Kelvin College Foodbank was set up to support students within our college and they are currently looking for donations of food and toiletries to top up their supplies. 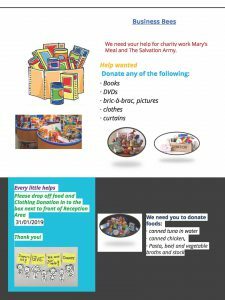 Suggested donations include: toothpaste, shampoo, deodorant, tinned foods and boxed foods. 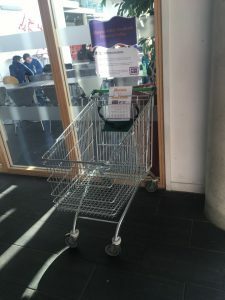 A box for donations has been placed in the main reception area in our campuses. Fundraising, Diversity and a Few Heroes! 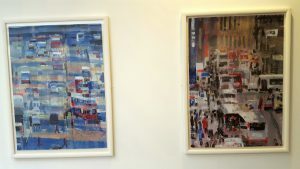 Another busy and interesting week here at Glasgow Kelvin College. 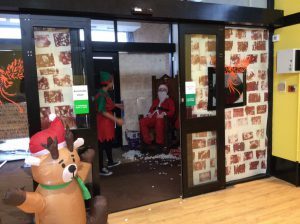 As usual we have had fundraising activities and visitors to the college and that's only part of it. Read on to find out what's been happening. 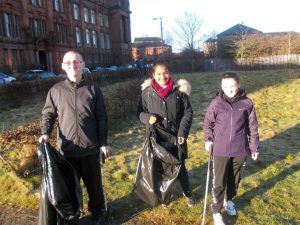 On the 1st February the Eco-awareness Level 2 class launched their litter picking group "Litter Heroes". 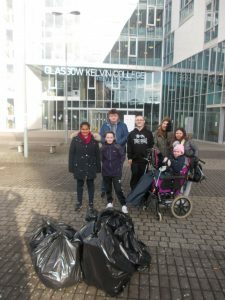 They carried out a litter pick around Glasgow Kelvin Springburn campus. Their aim is to keep the College litter free and clean. The Litter Hero clean up will happen on the first Thursday of every month during break time (10.30 -11). This is open to both students and staff and everyone is welcome to join us and to keep the College a litter free environment. The next litter pick will happen on Thursday 1st March 10.30-11 at the front of the College. Come and join the Litter Heroes! 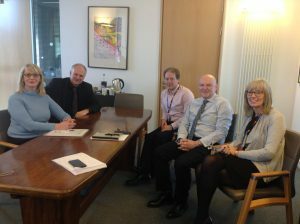 The College was delighted to welcome Janie McCusker, the new Chair of Glasgow Colleges Regional Board (GCRB), to our Springburn Campus this week. 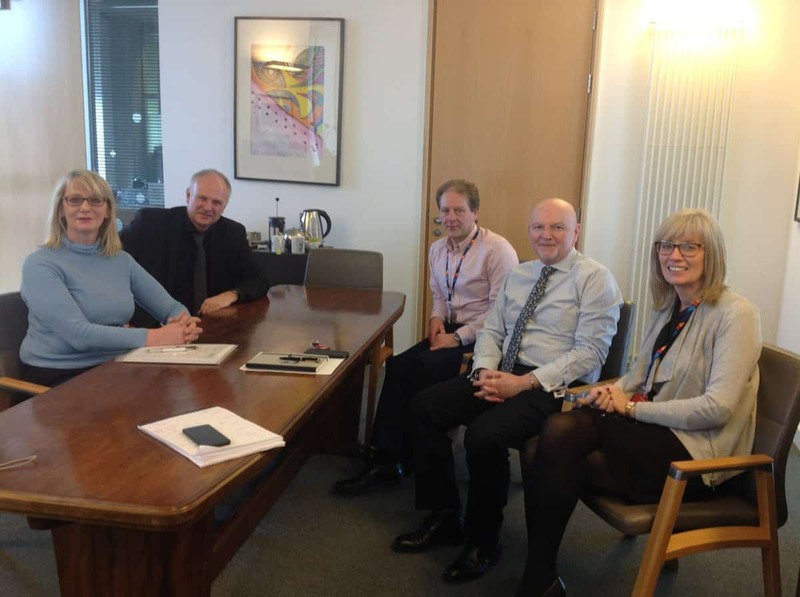 The Principal and colleagues discussed the unique context of Glasgow Kelvin's operations and our ambitions for our learners, staff and communities. 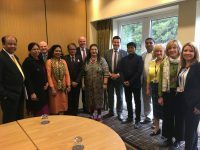 Janie outlined her own vision for the shared development of the Glasgow region and how collaboration will generate inclusive growth for Glasgow and Scotland. 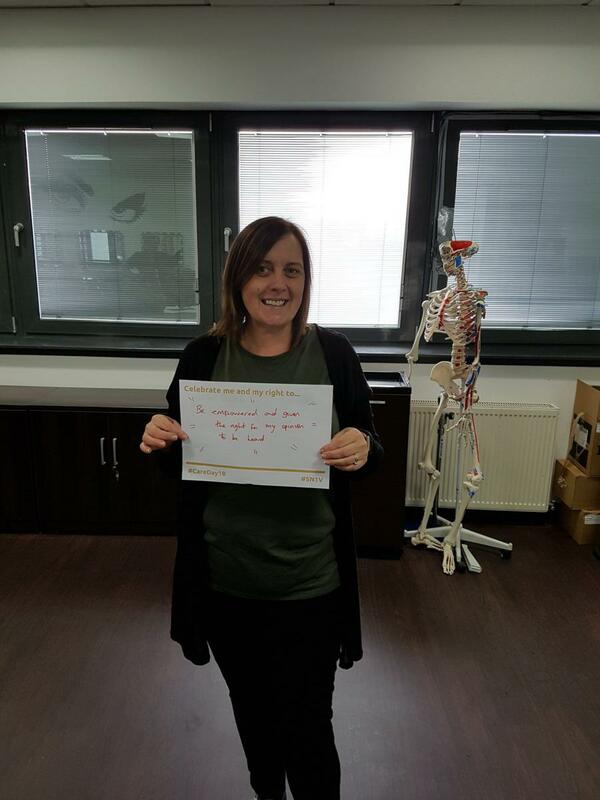 We are looking forward to working with Janie and wish her every success in her new role. Staff From the Plumbing section have recently taken delivery of two new Lenovo Miix tablets, which they identified as central to progressing their Empowered to Take Action Project for session 17/18. Mark Campbell and Scott Irwin's students have already reaped the benefits of these devices, in terms of streamlining/updating assessment procedures and improved evidence gathering in the workshop setting. 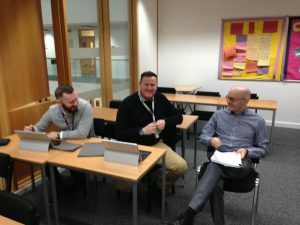 The recognition of these staff being ‘early adopters’ of innovations in learning and teaching, has also given rise to discussions around the provision of support for developmental CAD work from Peter Brown, investigation of the potential of 3D ‘sketching’ packages and the possible use of virtual reality materials as useful teaching and learning tools. 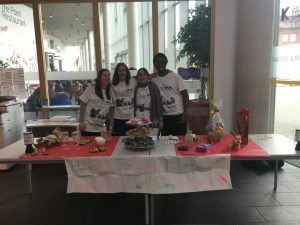 A group of four students from Level 4, Business, Administration & Enterprise are collecting Cat/Dog Food, Bedding, Toys and donations on behalf of the SSPCA. 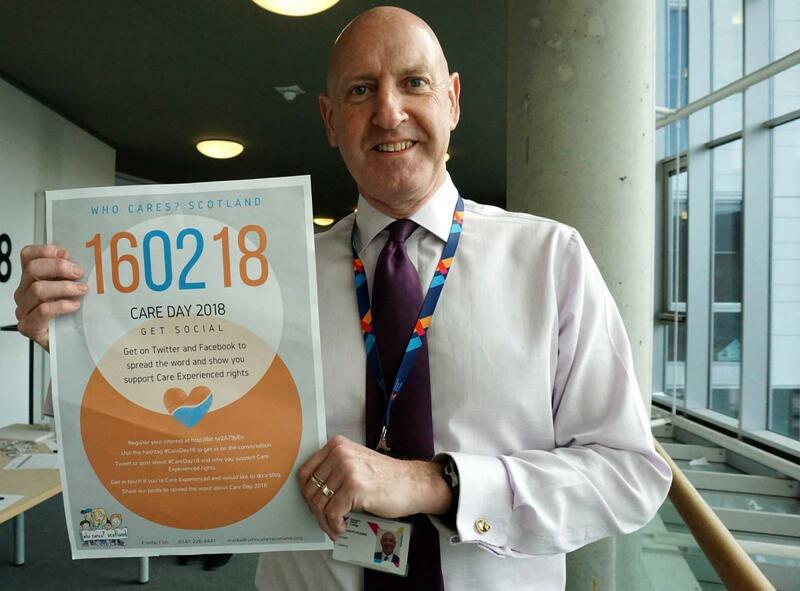 They are based in Springburn Campus. 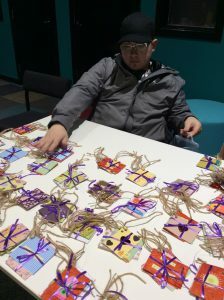 The group held a raffle on the afternoon of the 8th of February at the Springburn Reception area, it was £1 per strip to win a gift from the table. They will also be collecting donations from the other Campus's if anyone wishes to bring anything in. 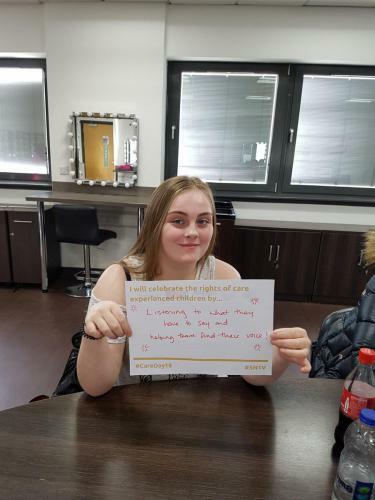 The group hope to be at Easterhouse Campus, next Thursday afternoon. The College will be running this competition for students to showcase how they embrace diversity throughout the College. Entries are encouraged from individuals or teams and can be showcased in a variety of ways. 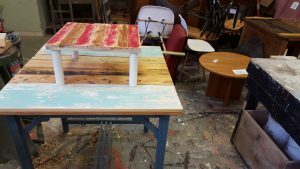 The entries must be original projects produced by the students. This is a fantastic opportunity for students, so why not participate in this to help us further mainstream equalities in our learning and teaching and to assist in breaking down barriers and increase understanding of the diverse nature of our College and of the wider community of Glasgow. There will be prizes for the students and the winners will be entered into a regional final. All the details and the entry forms will be on the website shortly. A recycled shopping trolley has been set up near the reception area of Springburn campus, for donations for the colleges food bank. 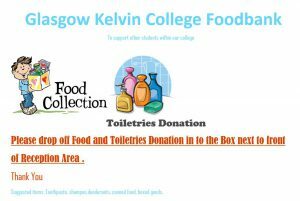 Donations are welcome from students and staff alike - tinned and dried foods as well as toiletries. Students who wish to visit the food bank can come along to room 117 (Springburn), at 4pm. Level 6 Business Administration students, based at our East End Campus, are currently working on a one-off student magazine as part of their Leadership into Practice unit, which requires them to be innovative. This project will see the students work together, to create a magazine that will keep students up to date with any changes or upcoming events within the campuses. 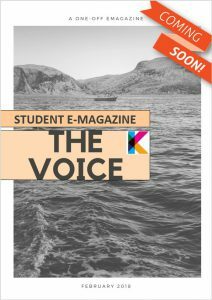 The Magazine will be presented on Sway making it easier for students to access. 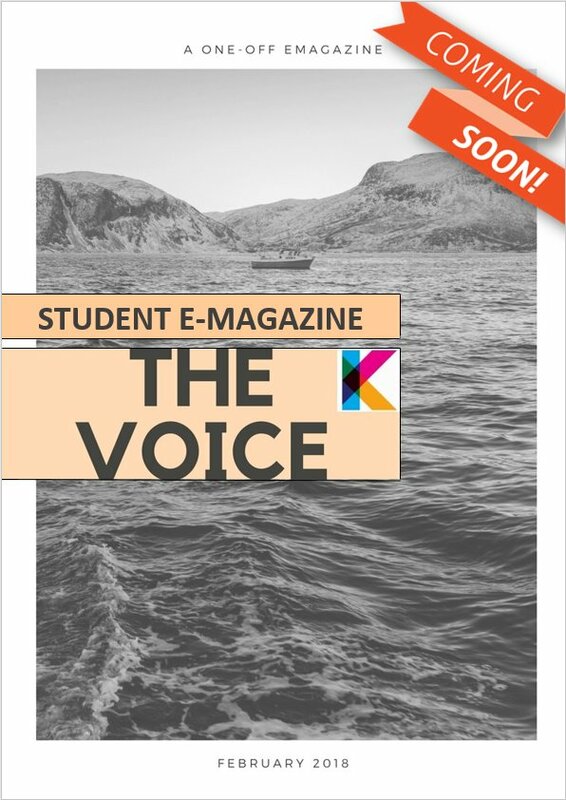 The contents of the magazine will include information on some of the courses that take place in the college, this will give the magazine readers an insight to what other courses are like, what is happening and how they can get involved in with the events. They plan to publish this E-Magazine on the 28th of February. 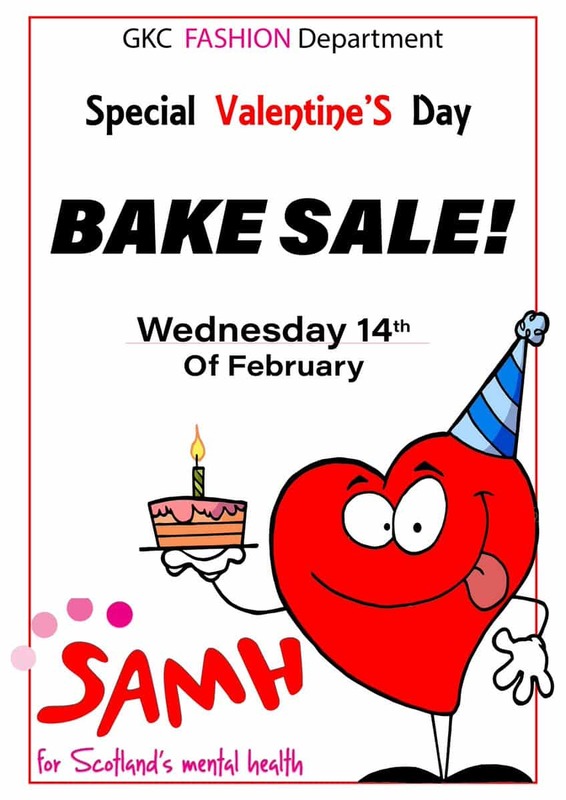 Once again our talented Fashion students will be whipping up a selection of tasty treats for their annual Valentine Bake Sale. 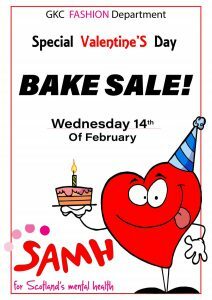 Cakes and other delightful treats will be on sale in our Springburn Campus reception on Wednesday the 14th of February. Pop along and indulge yourself and maybe even pick up that very last Valentine sweet gift. All proceeds will be donated to SAMH. That's us finished for another week, but remember the blog relies on you to keep going. 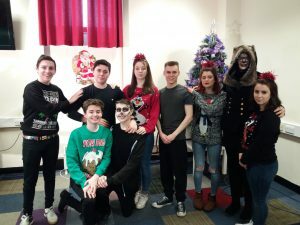 If you, your class or an individual student have been involved in any activities or events, you've been fundraising, you've all gone on a trip, won an award or you've had a guest speaker in your class, then we want to know. 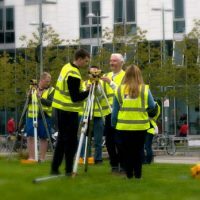 Tell us by emailing a few lines / paragraph of text about the event and any pictures you have, to Tracey on tborland@glasgowkelvin.ac.uk and we will makes sure it goes in the next Blog update. Pulling Together and Supporting Others! Welcome to the last blog update of 2017, we have quite a lot to share with you this week, so let’s get stuck in. 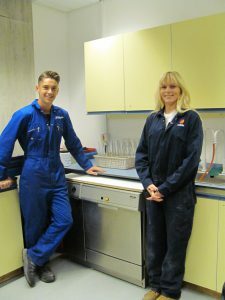 When the washing & sterilising equipment for the College Science Labs at Springburn failed recently, it was declared irreparable and the College could have been looking at a bill of around £9k for a replacement. Step in, the intrepid HVAC (Heating, Venting & Air Conditioning) Service & Maintenance crusaders to set things to rights. Lecturer, George Blacker, set two of his students on the task who diagnosed the problem, helped order the new part and fitted it under the watchful eye of their tutor. The result – a fully functioning and effective piece of kit to complete the Science Lab equipment! The two expert students, Maigan McKenna (an apprentice with Mitie) and Martin McNab (from Richard Irvin) were very pleased with their work and delighted to get in some good hands-on experience. Maigan came to College through an online advert. She was interested originally in electrical engineering but the course was full when she applied. 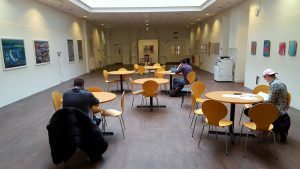 However, Glasgow Kelvin College Admissions stayed in touch with her and contacted her to let her know that there was a possible place available on the Refrigeration, Air Conditioning and Heat Pump Systems course which she was delighted to take up. An apprenticeship opportunity arose through close links which staff have with employers and she began her HVAC Modern Apprentice journey 3 years ago. 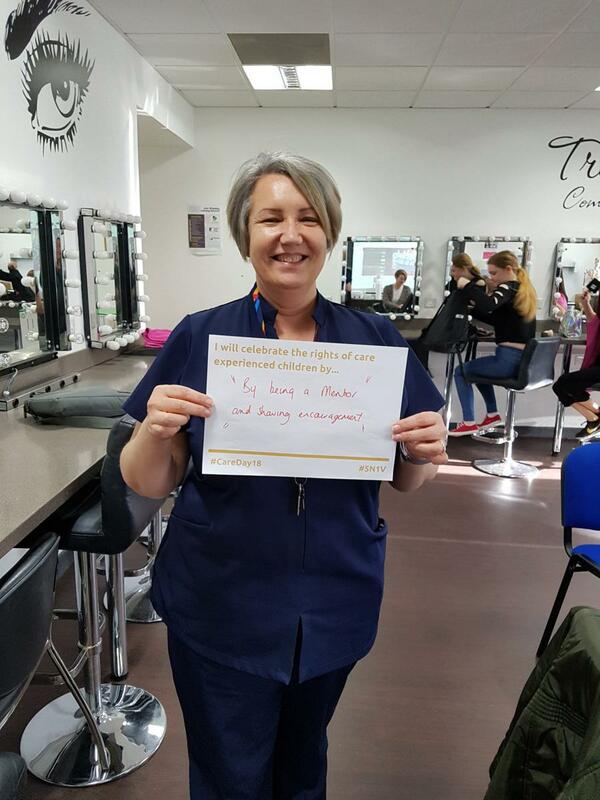 The College is very keen to encourage young women to take up building services engineering skills and other trades areas where women are under-represented. 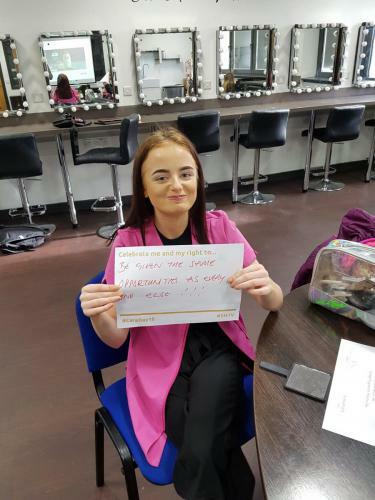 “Being at College has certainly helped me build my confidence, with presentations and talks to the class,“ says Maigan. 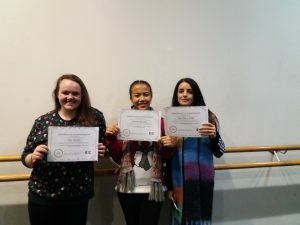 Both young people are to be congratulated on their skills and professionalism, due in no small part to the role their tutors have played in their learning. Well done to all. 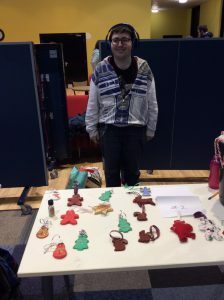 The Christmas Fayre on the 6th of December at the Phoenix Community Centre in Easterhouse was a big success. 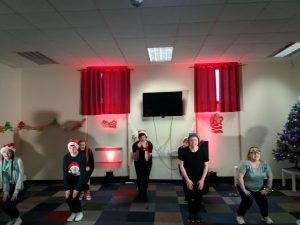 The fayre was a collaboration between the HND Acting and Performing students, NQ Musical Theatre and Supported Learning Students. 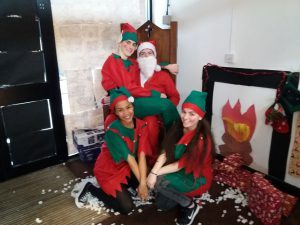 Members of the local community popped in and enjoyed a production of Shrek and Little Red Riding hood by the drama students and visited Santa’s Grotto. 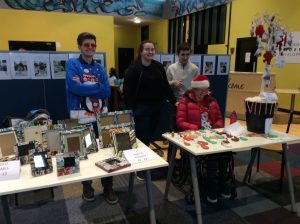 They also had the chance to buy some hand made Christmas arts and crafts. 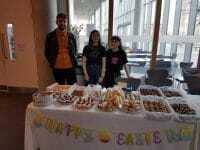 The students raised over £200 for the Phoenix Centre and SENSE Scotland. 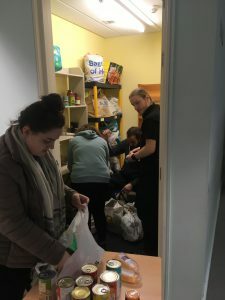 On the 18th of December Kayleigh, Melanie, Kieran and Filip worked hard to get their food bank up and running, this project is part of their Duke of Edinburgh Award. 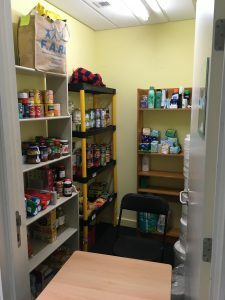 This foodbank is for students, and will be run by students. Any students needing assistance can speak to guidance about coming along. If you would like to make a donation, there is a box in the reception at our Springburn Campus. Well done to the nominated NQ, 1st and 2nd year Actors, and Dancers who were awarded their Certificate of Achievement for the following: Going above and beyond, supporting others, having good attendance and timekeeping and being a positive example to others. 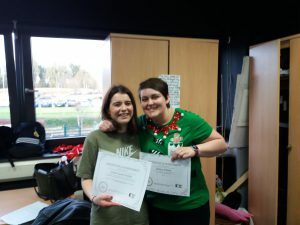 The winners were nominated by peers and teaching staff. Well done – Annie Laurie Scobie, Kelsey Wilson, Sabrina Mandulu, Amy Sinclair, and Ann Marie Keith. Musical Theatre students still to be announced. 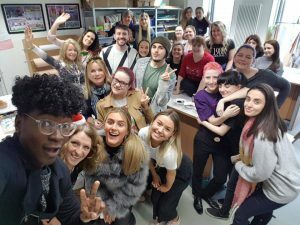 GKC Fashion staff and students celebrated their recent fundraising efforts for SAMH with a festive get together with enough cake to feed the entire college. 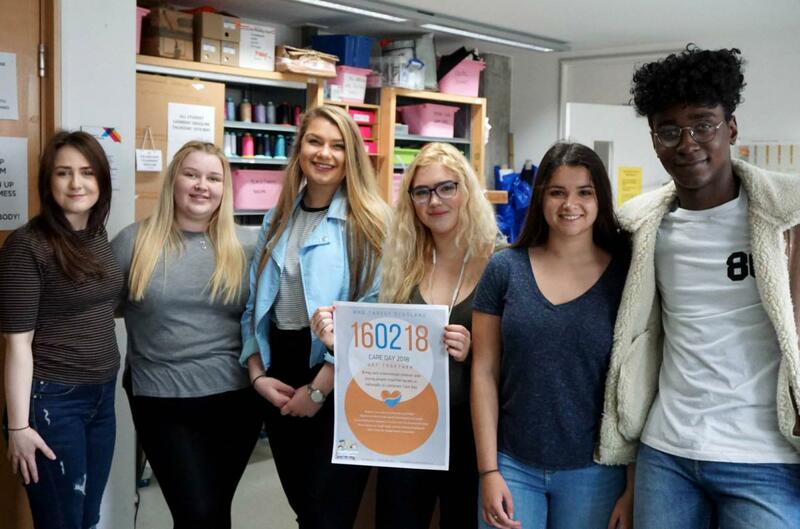 They will see you all in the New year for the build up to another exciting fashion event with plenty of fundraising events along the way. 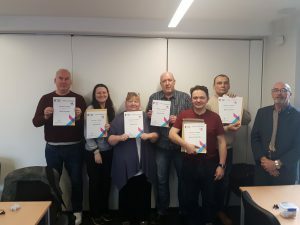 Learners from Rosemount Lifelong Learning ‘Time for a Change’ on successful completion of their programme. A great achievement and well done to everyone involved! That’s us covered everything this week, we hope you have enjoyed this updated and others throughout the year. College classes resume on Monday the 8th of January 2018, so enjoy your break and we will see you all back here in the New year.